Cover includes 7 retaining clips to prevent slippage and those nasty draughts. The biggest and best Bedchair Cover available. 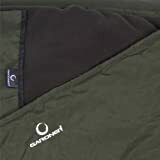 Made from a hard wearing 100% waterproof carpy green fabric. Inner lining is made from a soft, tight-pile, breathable fleece that is extremely warm and lasts a lifetime of regular use. The cover includes 7 retaining straps/clips to prevent it slipping off the bed and the overlap is cutting out all of those nasty draughts. This Bedchair cover is extra large and works with the biggest bed chairs available. Monster sizing: Length= 254cm, Width= 178cm. This entry was posted in Carp Baits and tagged Bedchair, Cover, Deluxe, GARDNER, Green, Tackle, Thermal. Bookmark the permalink.